I thought you should know that I’ve met someone new. And I’m positively smitten. Please know that it’s nothing personal. I still care for you. Really, I do. It’s just I’ve found someone who shares your same crunch, your same tang, and that fine dill flavor – but with so much more to offer. These beauties also have a subtle, well rounded garlic flavor packed into their jars. And to be fair, well, it’s because they are garlics. Garlic scapes anyways. I think my new love and I have a promising future together. I can see them on antipasto platters, mixed into salads, and bobbing around in tomato-based cocktails. And I’m already dreaming of the cold, dreary March afternoon when I pop the lid and start eating straight from the jar. I hope you can take comfort in the fact that without you, my dear Dilly Beans, I might not have ever even discovered my new crush. So I promise to make room for both of you on my plate. I only hope you can wait until my dilly scape honeymoon is over. It’s true. I’ve fallen for another. I was sort of set up though. 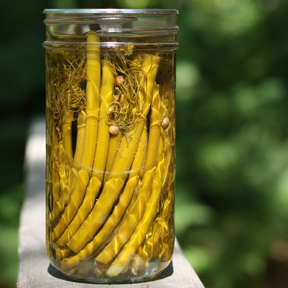 It all started a week or so ago when I was reading through one of my latest favorite books (in preparation for kimchi and kraut season), Wild Fermentation by Sandor Ellix Katz when I came across his father’s recipe for classic dilly beans. Here’s where things start to get sticky. I knew there was a few pounds of fresh picked scapes waiting in the fridge. Hmmm. I did a quick google search that revealed that I wasn’t alone in my wayward ways. There are a handful of people out there who share my same wild thoughts. Next, I went to my tattered copy of the Ball Blue Book of Canning and compared dilly bean recipes. I settled on a combination of the two recipes and got to work. I rationalized that it wasn’t intentionally going astray. I mean let’s be honest, the green beans are weeks away from being ready. I couldn’t have pickled them if I wanted to. I just settled for the next best thing, that’s all. How can I help it if I happened to fall head over heals? Gather, wash, and sterilize your canning jars. 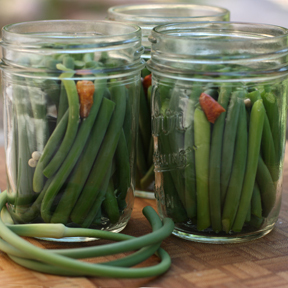 If you really pack the jars tightly, one pound of trimmed scapes will fill about 36 ounces of jar space. I did a combination of 8 ounce, half pint jars and taller 12 ounce jars. If you don’t plan on doing a tight pack, you will need more jars AND more brining liquid, so plan accordingly. Wash and dry the scapes (if necessary) and trim the tops, just below the bulging flower head. Do I need to remind you to save the tops to make a stock with? I didn’t think so. Next, do a quick jar measurement and trim the scapes to fit into whatever size jar you have chosen so there is about 1/2 inch of headspace. 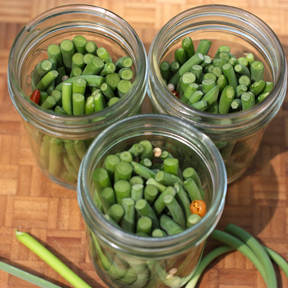 After you have trimmed all the scapes to size, pack them into the sterile jars, sort of bending out the curvy parts as you go. Add 1 fresh dill head (or leaves), 1 dried chili pepper and 2-3 peppercorns to each jar. For the brining solution, bring the water, vinegar, and salt to boil in a saucepan and remove from heat after salt has dissolved. Pour the hot brine into the jars, filling until there is 1/4 inch of headspace. Secure sterilized 2 part lids and process in a boiling hot water bath for 10 minutes. Remove from canner, let cool, label jars and store without bands for at least a few weeks to let the flavors develop. I feel bad for the dilly beans. It’s hard to be left behind for new love.